Monthly intercessory prayers are held on the second Saturday of each month at the Cathedral of the Good Shepherd. During these prayer sessions, we intercede for the archdiocese and the people behind its organisations and projects. 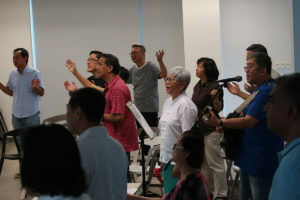 These prayer sessions provide a regular platform for the Foundation to lift up the needs of the archdiocese in prayer. This helps the Foundation to always keep in mind that it is only by the grace of God that it can achieve what it has set out to do. You can also join others in our Church and share a prayer for the archdiocese at here. The Catholic Foundation has created an online prayer group to intercede for the archdiocese. Facilitated by a chat group created in the messaging application, WhatsApp, several volunteers and staff of the Foundation join one another every week in remote prayer at an agreed time. 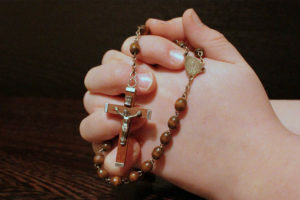 Every Wednesday at 10.00 pm, members of this chat group spend half an hour wherever they are to pray the rosary for a common list of intentions. Mission Masses are held twice a year, so that every donor and volunteer will have a chance to come to express thanks to God for the work that is being done in the archdiocese. 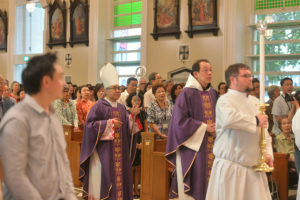 The Annual Thanksgiving Mass is held for benefactors, volunteers and representatives of various archdiocesan organisations, who come together to praise and thank God for all the work made possible through God’s grace binding the efforts of the many offices and organisations as one Church. 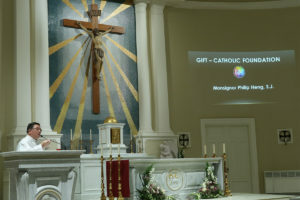 Held at the Cathedral of the Good Shepherd, it is celebrated by the Archbishop with the key archdiocesan organisations offering special gifts symbolising their work.